The European Vision Institute congratulates Prof. Carlos Belmonte to this prestigious award. Carlos Belmonte has made seminal contributions to the functional characterization of the non-visual sensory innervation of the eye. Using cellular, electrophysiological and behavioural techniques, he unveiled the functional characteristics of ocular sensory nerves and their role in ocular sensations as well as in the neural regulation of various ocular functions (tearing, blinking, regulation of ocular blood flow and intraocular pressure), on corneal trophism and on wound healing. His findings represent a fundamental advance in our present knowledge of the neurobiological basis of ocular discomfort, pain and dysesthesias, both in normality and in a number of pathological situations such as dry eye, contact lens wearing, herpes, diabetes and postsurgical pain. In addition, Prof. Belmonte has developed a new esthesiometer (the Belmonte Esthesiometer) that measures separately the different modalities of corneal and conjunctival sensation in humans, allowing a more complete clinical evaluation of the ocular surface sensitivity. He has also contributed to identify the participation of sensory neuropeptides in corneal wound healing, discovered the existence of sensory and autonomic fibers activated by intraocular pressure changes and, very recently established the role of cold ocular fibers in the maintenance of basal tear secretion. The first functional characterization of the different types of sensory fibers and neurons innervating ocular tissues (J. Physiol.1981, 1993; Neuroscience, 2000) and the correlation between neural activity in these sensory fibers and human sensations in the ocular surface (IOVS 1999; J. Physiol.2001). The demonstration of a trophic dependence between corneal epithelium cells and trigeminal sensory neurons, as well as the role of Substance P in this process (IOVS, 1990; Exp. Eye Res. 1994). The demonstration that intraocular pressure (IOP) variations within physiological limits activate afferent sensory nerve fibers that transmit to the CNS a sensory message about IOP values. Also, the first published experimental evidence that IOP variations elicit concomitant reflex changes in nervous activity of autonomic (sympathetic and parasympathetic) nerve fibers (Exp. Eye Res, 1971, 1973). First electrophysiological characterization of cold thermosensitive primary sensory neurons and discovery that different potassium currents contribute to cold transduction and thermal sensitivity of cold thermoreceptors (Nature Neurosci. 2002; J. Neurosci., 2009). The first direct recording of electrical currents in identified single mammalian sensory nerve terminals (J. Physiol. 1998; 2001). The demonstration that genetic deletion of the NK1 receptor for Substance P in mice alters nociception, analgesia and aggression (Nature, 1998). The first direct proof that nociceptive nerve terminals subserving pain have separate membrane mechanisms for transduction of mechanical and chemical noxious stimuli (J. Physiol.,1991) thus predicting the existence of TRPV1 channels in nociceptors. The first demonstration that electrical properties of primary sensory neurons are dependent on the type of peripheral sensory receptor to which they are connected (J.Physiol.1983, 1985). The work of Prof. Belmonte has received wide international recognition, particularly in recent years, due to the growing importance that ocular pain and discomfort are acquiring in clinical Ophthalmology. His pioneering studies on the functional characteristics of ocular sensory innervation became established doctrine and are now part of textbooks. Carlos Belmonte combined his research activity with a distinguished academic career and has trained many of the most prominent professors and researchers in Medical Physiology and Neurosciences of Spain. He became Full Professor of Physiology in the Medical School of University of Madrid at the age of 27. In 1971, he was awarded with an International Fellowship from the Fogarty International Center, NIH, USA and expends 2 years in the Dept. of Physiology, University of Utah, working on electrophysiology of chemoreceptors with Carlos Eyzaguirre and of invertebrate photoreceptors with the Nobel Laureate Keffer H. Hartline. At his return to Spain in 1973, he was appointed Professor and Chairman of Physiology in the Medical School of Valladolid. In 1980 he was appointed Vicepresident of the University of Alicante that he helped to create being elected afterwards the first Dean of its Medical School. In the University of Alicante Prof. Belmonte also founded and directed during the last 20 years, the Instituto de Neurociencias, a joint research Center of the University and the National Research Council (Consejo Superior de Investigaciones Cientificas). This Institute has become the largest and most prestigious institution devoted to brain research in Spain. Prof. Belmonte has maintained a very active international scientific life. He has been Visiting Professor at the Universities of Harvard and Utah (USA), visiting scientist at the Eye Research Institute, Retina Foundation, Boston (USA) and at the Prince of Wales Medical Research Institute, Sydney Australia. He is also an associated researcher at the CRCERT (Sydney, Australia) and is a member of the editorial board of the European Journal of Neurosciences, Pain, Experimental Eye Research, Primary Sensory Neuron, Molecular Pain, Journal of Physiology and Biochemistry. Prof. Belmonte has been the Secretary-General and is currently the President of the International Brain Research Organization (IBRO). He has been President of the Spanish Society of Neurocience and Secretary and President of the International Society for Eye Research. He is member of the Academia Europaea, of the Royal Academy of Sciences of Spain and of the Akademie der Wissenschaften und der Literatur, Mainz, Germany. 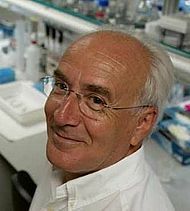 Carlos Belmonte, is presently professor of Physiology at the Instituto de Neurociencias, Universidad Miguel Hernandez-Consejo Superior de Investigaciones Científicas in San Juan de Alicante, Alicante, Spain. Question 1: What was your first reaction, when you realized that you are the winner of the European Vision Award 2011? I felt very pleased and honored. For scientists, the most appreciated recognition is that coming from their own colleagues. Besides, I am a convinced European and feel proud of receiving an award that represents the values of our desire to work and live together. Question 2: Looking back, what decisions were the important key factors for your own research career? Personally, the choice of my research mentor in early days, Professor Antonio Gallego was critical, because he tried to give me a modern view of research and life in a very difficult period of the history of Spain. My years as a NIH postdoctoral fellow in USA were also fundamental to understand and appreciate the rules and values of international research. And finally, the decision of returning to my home country to contribute actively to the development of its research infrastructure, badly needed in the post-civil war Spain, was very important to define what and how I could do in research during the rest of my life. Question 3: What are your research priorities for the next years and who do you judge the present development in Vision Research? My efforts, with the essential collaboration of my co-workers of many years that I wish to thank here now, will be directed to extend our knowledge on the functional aspects of the sensory innervation of the eye, in particular about the neural mechanisms underlying ocular discomfort and pain and on the trophic interactions between sensory neurons and their ocular target tissues. The lack of scientific knowledge on the neural basis of ocular sensations is surprising considering the clinical and social importance of its disturbances (dry eye, post-surgical pain, contact lens discomfort). Eye research has experienced an impressive development in the last decades. I attended first an ARVO meeting in 1973 and we were about 300 people. Today, this figure is over 10,000. In Europe, eye research was defined as an independent field quite recently and has now excellent specific research centers and world-class scientists. I wish for Europe a more defined academic and professional status for scientists working together with clinical ophthalmologists and generosity in our hospitals and public institutions to allow our motivated ophthalmologists to conciliate their clinical work with the development of experimental research. Question 4: What is the strategy to promote young promising scientists? First, to apply demanding criteria of scientific and intellectual excellence in their selection processes, and to expose them thereafter to a multidisciplinary vision of modern science. It is critical in my view to provide the most capable young researchers during at least 5 years, with the infrastructure and the financial support necessary for the development of their own ideas and projects, preventing the loss of energies and time involved in the continuous search of working opportunities. We need a new generation of first-class young eye scientists in Europe that works intensively, without interferences and uncertainties about their future. Question 5: Dear Prof. Belmonte, the fairy godmother gives you three wishes for free. Would you tell us these three wishes? At my age I do not believe in fairy godmothers and wishful thinking but rather in defining realistic goals and in working very hard to obtain them!. That said, I wish that the gradual acceptance of scientific values as common base for the relations between humans helps us to develop a more rational and peaceful global human society. I would also like personally to witness as long as possible the impressive advances that our scientific knowledge is providing every day and, finally I wish a happy and successful life to all my colleagues and friends in the eye research community, in particular to those that were so kind to select me for this wonderful award. The European Vision Institute European Economic Interest Grouping (EVI EEIG’) was legally constituted under European law in the late year 2003. The major objectives of EVI are to encourage cross-border cooperation in Vision Research with special emphasis on supporting research, training, health information, dissemination and other programs in the areas of blinding eye diseases, visual disorders, mechanisms of visual function, preservation of sight as well as the special health problems and requirements of the blind and visually disabled. The members of EVI are vision scientists, research institutes / institutions, universities, private companies and patient organisations. At present, the chairman is Prof. E. Zrenner, Germany, who is supported by the Steering Committee, consisting of Profs. J. Cunha-Vaz, Portugal, P. Luthert, UK, J. Sahel, France, A. Wenzel, Switzerland and N. Pfeiffer, Germany. The Board of Trustees is formed by the Profs. C. Reme, Switzerland, T. van Veen, Sweden and E. Luetjen-Drecoll from Germany. EVI was not formed for the purpose of making profits for itself. Its function is to carry out activities ancillary to those of its members, including but not restricted to research, technological development, organisation, management, fundraising and publicity pertinent to the defined aims to safeguard the procedures for high-quality Vision Research throughout Europe and worldwide.